A Father’s Day Message Worth Repeating! Since Camera Box is celebrating its 40th anniversary, we thought this is the perfect time to once again reflect on our founder, Glenn Shearer! Here’s a post Tammy wrote last year in memory of Glenn. 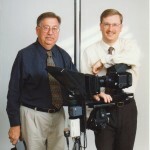 Glenn has been gone for over 10 years, but the Camera Box continues to progress through technological changes and advances in the photography industry. He saw the beginning of the digital revolution, and he would have loved the increased creative opportunities available today while understanding current economic challenges.